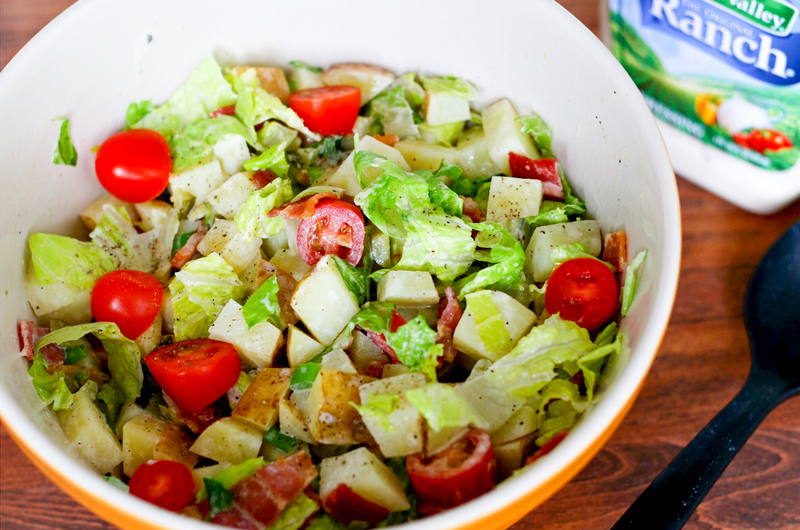 This salad is seriously so so so delicious. 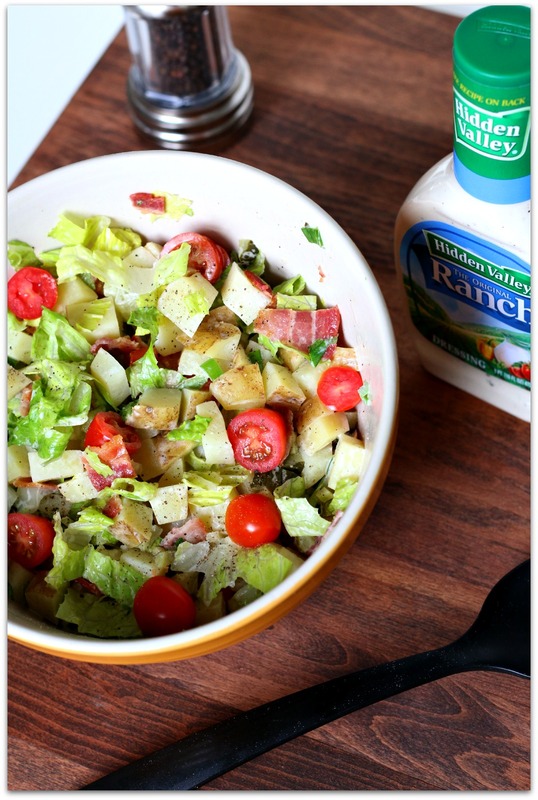 It’s the perfect salad to make for your summer gatherings. It pairs nicely with BBQ ribs, chicken, or burgers (basically any meat on the grill). It is not your typical drowning-in-mayo, boring potato salad. It is fresh and has all sorts of fun flavors that come together beautifully. 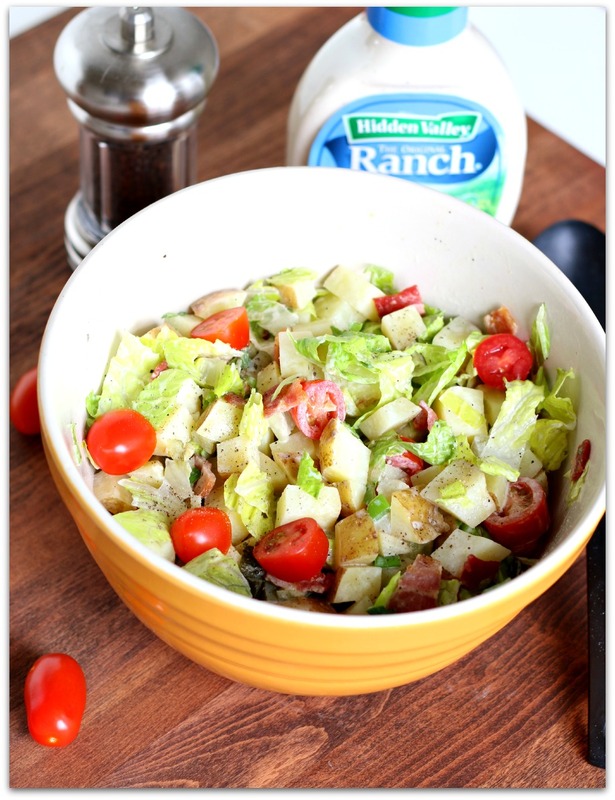 And for a fun twist it uses Hidden Valley Original Ranch instead of mayo. Step 1: You'll need 1¼ pounds of yellow potatoes for this recipe, or about 3 Yukon Gold potatoes. I leave the peels on for this recipe. 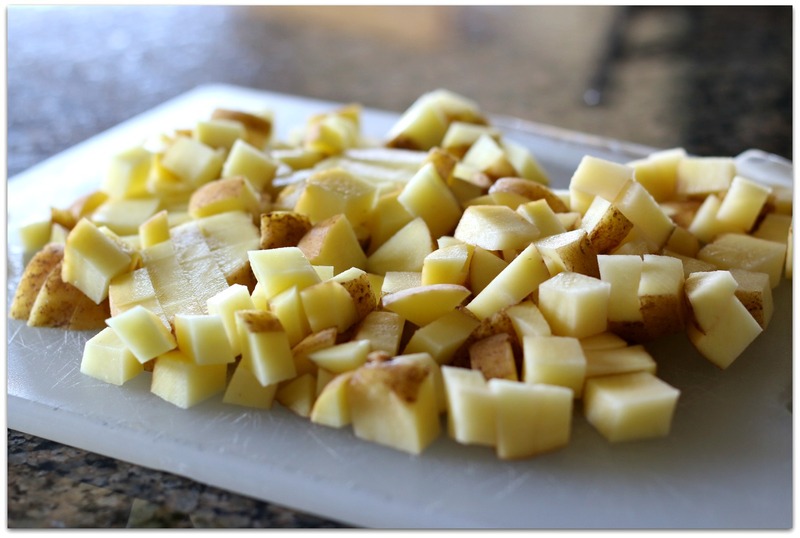 On a cutting board, slice up the potatoes into ½ inch cubes. 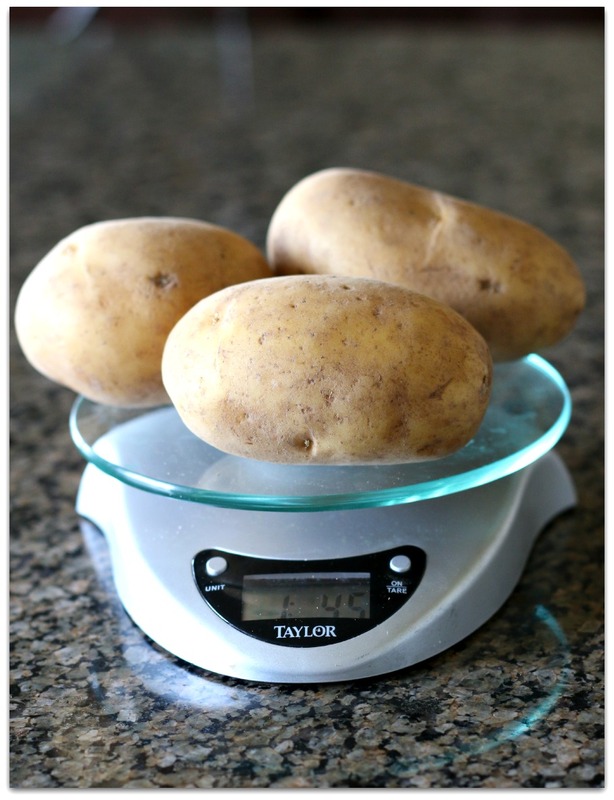 Place the cut potatoes into a pot and cover with cold water by 1 inch. Add 1 tablespoon of the white wine vinegar and 1 tablespoon of salt into the water. Place on a burner and bring to a boil over medium-high heat. Step 2: Once the water begins to boil, reduce heat to medium-low and let simmer for about 12–16 minutes, or until potatoes are tender but firm. Drain the water from the potatoes and place them in a medium-large serving bowl. Step 3: Toss them with 1½ teaspoon of white wine vinegar. 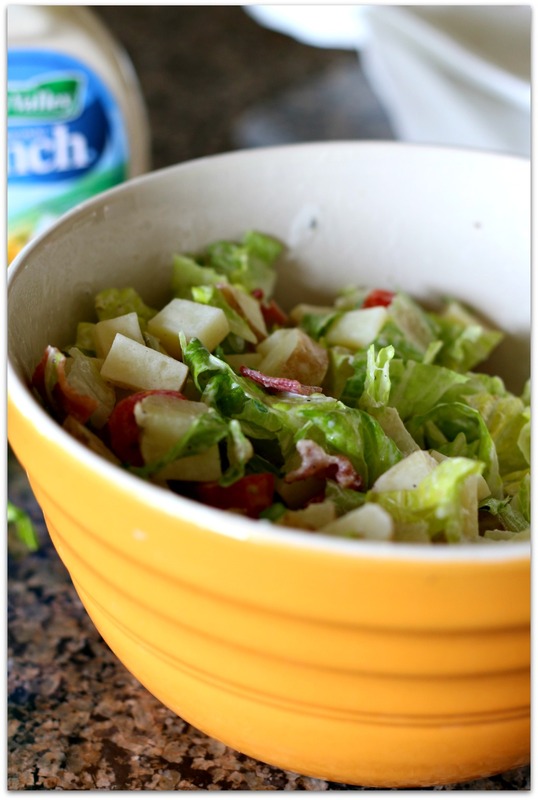 Put them into the fridge for about 10 minutes, while preparing the other parts of the salad. Step 4: While the potatoes are cooking, you'll want to fry up some bacon. 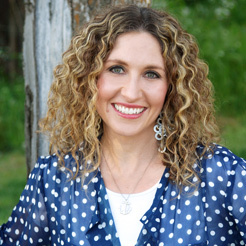 The way that I do it is so easy (plus easy clean-up, too)! Just get a cookie sheet and line it with heavy-duty foil. 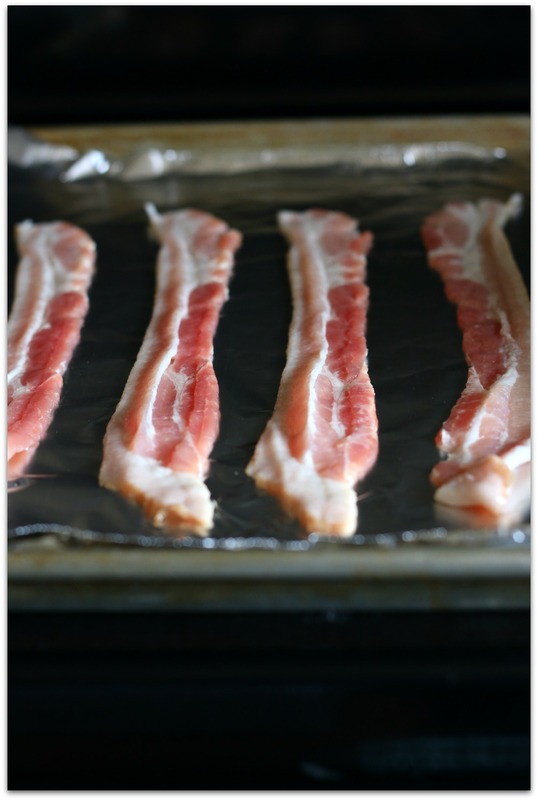 Place four strips of bacon on top of the foil and put the cookie sheet into a cold oven. Turn the oven on to 425° F and let the bacon cook in there for about twelve minutes. Check the bacon and cook longer if necessary; it's done when it's cooked to a crisp. I like mine super crispy so I go for about 22 minutes total. Step 5: Once the bacon is cooked and is crispy, take the cookie sheet out of the oven. Place the bacon onto a thick layer of paper towels and blot all of the grease off of the bacon. Cut the bacon into ½ inch pieces. 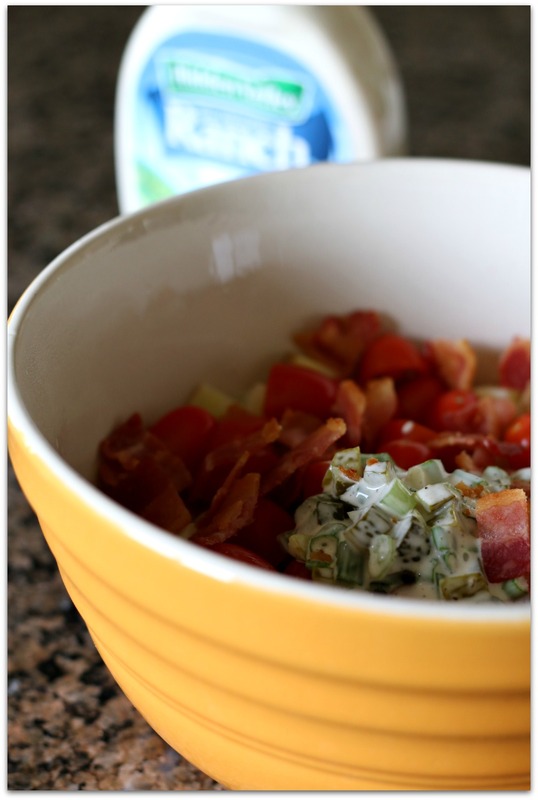 Step 6: While the bacon and potatoes are cooking, add Hidden Valley® Original Ranch® Dressing to a small bowl. Dice up the green onions and the pickle into small pieces. 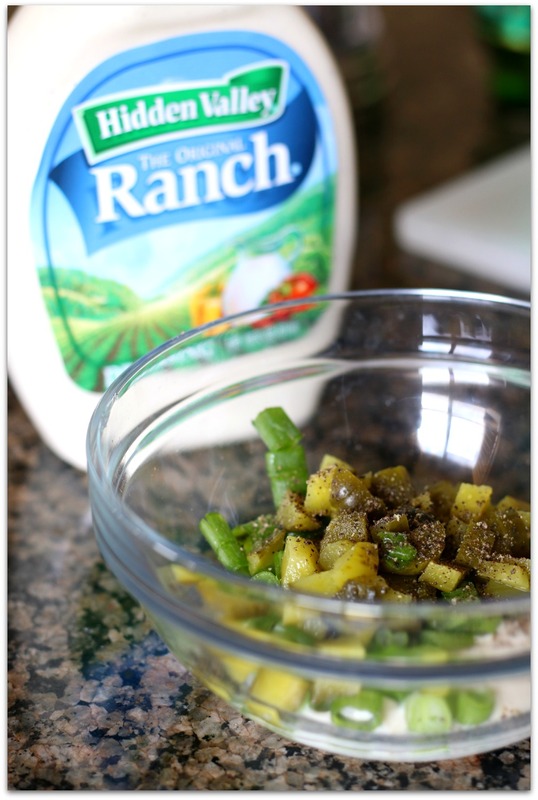 Add the green onions and pickle into the ranch dressing. Add in 1½ teaspoon of white wine vinegar, ¼ teaspoon of salt, and freshly ground pepper to taste. Step 7: Cut the grape tomatoes in half. Cut the washed romaine into 1 inch pieces. Step 8: Add the dressing mixture into the potatoes and gently fold it in until potatoes are well coated. Then add in the bacon pieces, the grape tomatoes, and the romaine. Gently toss and serve. This recipe will serve about six people as a side dish or about four people as the main dish.